You’ve been groggy with fatigue all day, but as soon as you go to bed you’re wide awake. For the first time all day, you’re fully alert. Even though you were too tired to stand fully upright you went for a long walk after lunch to make sure you’d be physically as well as mentally tired when you went to bed. And you are – absolutely exhausted. But when you go to bed you toss & turn until eventually you give up & go downstairs again. I wrote that more than two years ago. I’d slept badly for as long as I could remember – it was unusual for me not to feel drowsy, as if I was thinking through a fog. If ever I wanted to pull a sickie at secondary school, all I had to do was not put on my under-eye concealer in the morning and I’d get sent home immediately by a concerned teacher. I was always reluctant to get up, and always exhausted when I did. Now, if that happens because you’ve been up all night partying and then had an early start, that’s just your body’s healthy reaction to fatigue. If it happens even though you spent nine hours in bed, because you spent so long trying but failing to go to sleep, and if that’s not the exception for you but the norm, then you’re into life-blighting territory. Insomnia has affected me when life’s been stressful and when it’s been good; when I’ve set my own schedule and when I’ve had a timetable imposed by work; when I’ve been living on my own and when I’ve had flatmates; when I’ve taken daytime naps and when I haven’t; when I’ve been a couch potato and when I’ve been sporty. I don’t know when I started sleeping badly, but I do remember that adults started commenting on the shadows under my eyes while I was still at primary school, and that when I was 13 or 14 I started using concealer every day to cover them up. I thought it was normal, the way kids do think that whatever they’re used to is the norm for everyone, but then I started to notice that at sleepovers and things I was always the last one to fall asleep, by a long shot. Later, at university, on evenings when I had an exam the next day and other people didn’t, I’d stay in and go to bed while they went out. It didn’t make any difference, though: I’d still be wide awake when they came home. In my teens and twenties, and well into my thirties, I thought it was something I couldn’t change. Finally, though, after three nights with a total of about 14 hours’ sleep, I was just so desperate I decided to try anyway. So I started Googling, and reading, and watching documentaries and YouTube videos – I was after any information I could get. It came as a revelation to find out that one of the criteria for diagnosing insomnia was taking more than 30 minutes to fall asleep – I don’t think I’d ever fallen asleep in less than an hour without alcohol or a general anaesthetic, and usually it was more like an hour and a half. The big question that even I ask when I think about my insomnia is why on earth I didn’t do something about it years before. But at first I thought that was how it was for everyone, and later I thought that was how it would always be for me. In a way it reminds me of people who are obese and think they can’t do anything about it because their bodies are just made that way: both they and I thought there was something innate and unusual about our bodies that caused our problems. To be fair, people with weight problems have often been told precisely that. The point is, thank goodness, insomnia wasn’t inevitable for me and probably isn’t for the vast majority of people, either. I watched this programme (apparently no longer available), and bought this book, and the results have been fantastic, though not fast. The reason I’m telling you this is that tackling insomnia has made a huge difference to my life, and if even one person who reads this decides to do something similar, I’ll be glad. If you can identify with this guy, I’m talking to you. 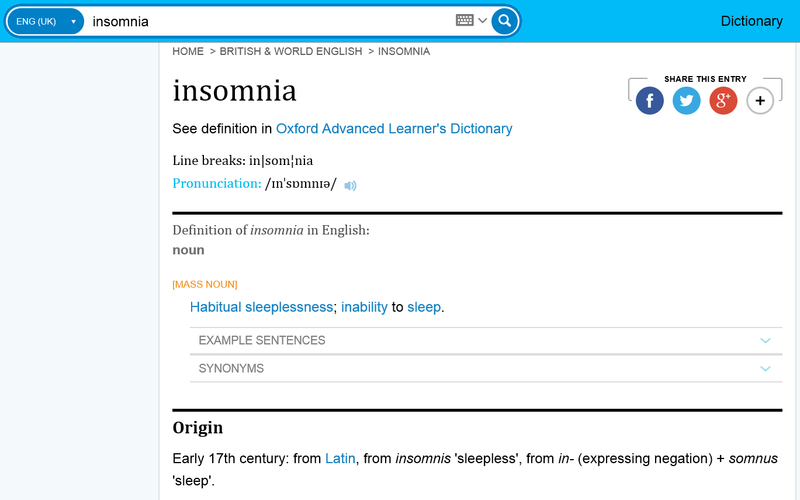 Having insomnia is miserable, and long-term, and it doesn’t just go away by itself. Do something about it – you’ll be so glad you did. October’s cause of the month is Chance for Childhood. Donate here. ← But who has the time for that?